Who knows that a simple experience such as shopping for a wallet could turn to be a profitable yet eco-friendly business? That’s what happened Jason Hooge years ago. The story began with him not being impressed with the choices and variety of wallets that were available. Out of curiosity and inquisitiveness, Hooge decided to not shop for wallets anymore and make them himself instead. Leather then became a hobby and he gave them away as gifts. He found himself so passionate in working with his hands and leather. He had no professional training, education, or professional experience working with leather. But despite those facts, he kept going, made prototypes, and founded Salt River Leather in 2013. His wife has been helping with the business. They even have booth where they sell other accessories. But the interesting part is that Salt River Leather makes wallets out of old baseball gloves. “I think the gloves are popular because it’s something everyone can connect to. Baseball is America’s game. I think people love the nostalgia. I like it because I take something that would stay in a basement or attic and I give it a use. Also, in my opinion, it looks really cool,” said Hooge. 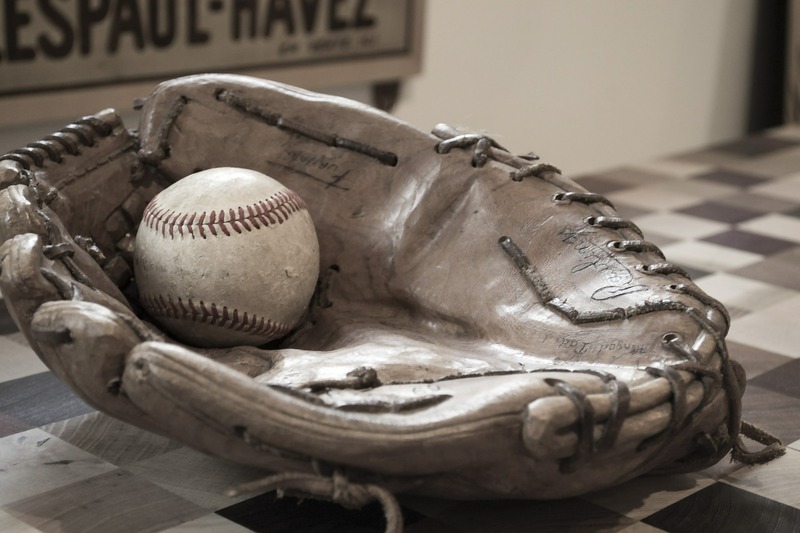 Hooge crafts his wallets from authentic, used baseball gloves. Sometimes he also uses football, too. That kind of material will give branding markings and scuffs from games which are still intact. The final products are wallets which look well-worn with rugged patina because the leather was used outdoors for an extended amount of time. In short, his wallets are for sports fans that will give them stylish upcycled accessories without involving virgin materials. This will give them a personal or individual way to keep their money and cards safe. It’s even more meaningful if the customers are avid fans of baseball who love rich history and the likes. And apparently, people love the concept and what Hooge is doing. There’s a customer called Andrew Hendershott which has become a loyal customer and has ordered a lot of products after he first met Hooge. Hendershott shared his sentiment and thoughts about the wallets. “The first wallet I bought got put on Twitter and was circulated around the Chicago Cubs Twitter account. I am huge Cubs fan. It was Ron Santo’s glove. He was an announcer for the Cubs when I was growing up and he recently passed away. My dad’s family is from Chicago,” he said. To honor Ron Santo, the Cubs wore a patch with Santo’s jersey number. Hendershott bought that patch and asked Hooge to sew it into the wallet. So Hooge’s business is also about custom orders and personalization. In fact, 25% of Salt River Leather is custom orders. But it wasn’t always like that. Initially, Hooge didn’t accept made-to-order wallets. “It took me 10 months before I would allow someone to give me a glove that was part of their family and make a wallet. I was very nervous to take someone’s childhood memories or grandpa’s glove,” he said. But times have changed and not only he accepts custom orders, he also gives $10 discount per custom wallets quite often. That makes his business even more popular and in-demand, since wallets are popular gifts. Now, he often offers a $10 discount per wallet on custom wallets. This time of year it is more challenging to take those on because he has so many orders (he’ll do it, but there’s a longer wait). The wallets are popular gifts and Hendershott said that he had given some for presents. “My best friend in the world who is currently deployed in a submarine, his brother just found his old baseball glove and they are sending it to me now to get this made as a deployment gift,” he said. Salt River Leather has three basic styles of wallets. The first is credit card sleeve with a price range from around $45-$55. Second is bi-fold with a price that starts from around $90. The third and most popular is three pocket wallet that costs around $60 with a logo or $45 without it. Hooge stated that American-made gloves are more valuable and more expensive. Certain brands can determine the price too. Sometimes the price can be up to $150. In the beginning, Hooge sold his wallets online. But one time he decided to sell them on a booth at Farmers Market of the Ozarks. This decision led him to sales boost and more success. Both men and women enjoy his work and craftsmanship. “Leather is tactile. Once you feel it, see it, smell it, put your hands on it, it gives you a good experience. I don’t have to put in the major investment of a storefront. I think sometimes people prefer buying an item they can feel and touch,” Hooge explained. Hooge is married with three kids. His wife, Sarah, started to help him after their second child was born. She decided to leave teaching in Springfield school district and become a stay-at-home mother. Around that time, Hooge was selling his wallets and running his business on his own. However, Sarah started making earrings and bracelets as additional wares for him to sell. He sold them and ever since, it’s become a part of the brand that continues to grow. Even though his brand is growing and it doesn’t seem to be losing to competition, Hooge is still fully employed. Salt River Leather is only a side business. He admitted that there are times when he wants to concentrate and focus on his leather business. Once, there was a request to make 200 gloves for Mets banquet, but he couldn’t do it because of time constraints. But Hooge is feeling great with his full time job, so he’s fine to keep Salt River Leather the way it is now. “I have an 8-5 job that I really enjoy and this is a different creative outlet. My day job is to produce videos and graphic design work and I wanted a hobby that would last a little longer than some of my videos and designs would. Six months from now, the video or graphic I produce may not be usable, but a wallet I produce will just start to get broken in,” he explained. “What he’s putting out there has value. They are extremely durable. In the event that anything goes wrong with his products, all you have to do it meet him at the farmers market and he’ll fix it,” Hendershott gushed about his favorite local artisan. So do you think there are more potential business that uses upcycled leathers or other materials like Salt River Leather? Tell us what you think in the comments below. Also, don’t forget to check out this article for related reading!